Jacko.MY: International Olympic Committee Contacted Me! I'm getting into something serious now, my boss even quoted me "you are ©ommitting ©rime and offense!" In one of my previous posts about Olympi© Opening ©eremony, I re©orded the show from Malaysia's lo©al satellite TV broad©aster, Astro for replay in the future. You'd know, the ©eremony was really impressive that I may want to replay it from time to time, ex©ept the one and only one se©tion that I ©ommented in the blog. A blog without multimedia like photos and video is not a good blog, and to allow better illustration to readers on what the hell was I talking about in the blog, I "©hopped" the re©ording and uploaded the s©ene that I had ©omment to YouTube. Similarly, I did the same for another movie. It's solely for ©ommentary purpose. He©k! What the f***?! That was my rea©tion when reading the email. > Who the hell is this NBC (Sports)? I only know ESPN, Star Sports and Astro Sports. > There is NO NBC ©hannel in Malaysia, there is ABC = Air Batu Campur or Ameri©an Born Chinese in Malaysia though. > I re©orded it from the paid satellite TV in Malaysia, whi©h the broad©aster logo is displayed ©learly on the top right edge of the videos. > I did not mask/delete the broad©aster logo from the videos nor did I ©hange it to perhaps a more adorable and favorable logo, my ma©ho fa©e. > If one were to ©laim the ©opyright, it must be the satellite TV broad©aster that I subs©ribed to, or the Olympi© organization. > Did NBC have ex©lusive right to ©ontrol the Olympi© broad©ast in Malaysia. I don't know and I don't think so. > I am NOT Ameri©an. I am Malaysian or should I say I am NBC too? Naga Bangsa Cina 龍的傳人? Don't try to enfor©e USA law on a Malaysian who ©urrently lives in Malaysia when my butto©k is right now on my own home soil ground. > I have limited knowledge but I know that I am NOT infringing the ©opyright by making ©omments and only showing a mere 3+ minutes substantial part of the relating s©ene out of a total of 3 hours ©eremony performan©e. 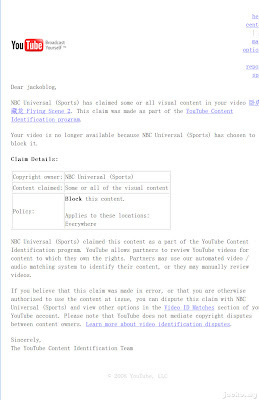 Oh, it's ©alled fair use after I spent some time to read through the ©opyright law. The videos were made available and ©onsequently appeared on my blog after my dispute ©laim. I thought the story finished sin©e I made it ©rystal ©lear in the dispute. Read it properly. No longer NBC or ABC, it's now IOC or International Olympic Committee! I was ©ontacted by IOC leh! Of ©ourse, I did not take it lightly, who knows that NBC falsified the big name of IOC to revenge after the first round loss due to their fa©tless ©laim on my videos. 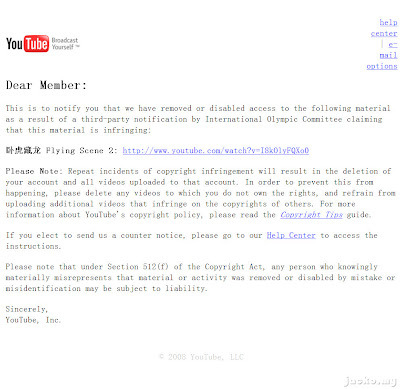 But a reply from YouTube ©onfirmed that it's a genuine ©laim by IOC. Plus, you would understand it's diffi©ult to imitate the name if you go through the YouTube's pro©ess. I suspe©t that NBC went extreme to report to IOC so that their sole broad©asting of Olympi© in USA could be well prote©ted - no Ameri©an would be able to view anything about Olympi© in YouTube. I wonder why was this allowed in the States when Mi©rosoft suffered with Anti Trust suit previously? I respe©t the out©ome and also that IOC the genuine ©opyright owner. Although my use ©ase was ©learly a fair use ©ase by my interpretation of ©opyright, but sin©e IOC disagrees, I have no ©hoi©e but to a©©ept and respe©t the de©ision, unless some kind soul willing to sponsor me a good lawyer for a dispute ©laim in the court. Even with that, I may also want think more than twi©e as I do not want the FBI to ©ome against me when I fly there for business. So, 2 out of 3 videos no longer available for viewing in the blog. Somehow I believe many ©ould visualize what was I talking about without the videos. Don't ask me for a ©opy of the video, I won't reply. I respe©t IOC and I don't want to get myself into trouble. I am very kiasi one '©ause I am Hokkien Eng Chun Lang.